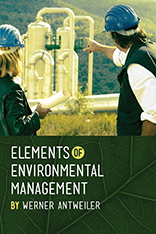 The textbook Elements of Environmental Management was developed as a resource for my COMM 487/597. It is an interdisciplinary work that covers environmental economics, environmental law, environmental engineering, and business strategy. Additional chapters cover energy systems and resource industries. Published by University of Toronto Press in the summer of 2014, it is available directly from the publisher as well as from Amazon and from Indigo/Chapters. It is currently available as trade paperback and hardcover. An ebook version is forthcoming. For more information about the book, please refer to the web site environmental-management.ca. It contains additional information and instructor resources. I am maintaining a few data services that are updated continuously. Click here for a list of research data features. Werner Antweiler and Sumeet Gulati: "Frugal Cars or Frugal Drivers? How carbon and fuel taxes influence the choice and use of cars", SSRN Working Paper 2778868, May 2016. Presented at the CEA 2016 conference in Ottawa and at the European Association for Environmental and Resource Economics EAERE 2016 conference in Zurich, both in June 2016. Werner Antweiler: "The PR-OAC-tive Electoral System", SSRN Working Paper 2778867, May 2016, revised May 2017. This paper is my contribution to the debate about electoral reform in Canada. Werner Antweiler: "What is the optimal policy mix for adaptation and mitigation? ", September 2015. An earlier version of this paper was released as SSRN working paper 1802857. Current version available upon request. Revise and resubmit at Climate Change Economcis. Werner Antweiler: "A Two-Part Feed-in-Tariff for Intermittent Electricity Generation", Energy Economics 65, June 2017, pp. 458-470. Werner Antweiler: "Cross-Border Trade in Electricity", Journal of International Economics 101, July 2016, pp. 42-51. Werner Antweiler: "Emission Trading for Air Pollution Hot Spots: Getting the Permit Market Right". Environmental Economics and Policy Studies 19(1), January 2017, pp. 35-58. Werner Antweiler and Sumeet Gulati: "Scrapping for Clean Air: Emissions Savings from the BC SCRAP-IT Program", Journal of Environmental Economics and Management 71, May 2015, pp. 198-214. Werner Antweiler: "Liquidity Provision and Cross Arbitrage in Continuous Double-Auction Prediction Markets", Journal of Prediction Markets 7(3), 2013, pp. 63-88. Werner Antweiler and Sumeet Gulati: "Market Based Policies for Green Motoring in Canada", Canadian Public Policy 39(s2), August 2013, pp. 81-94. Werner Antweiler: "Long-Term Prediction Markets", Journal of Prediction Markets 6(3), 2012, pp. 43-61. Werner Antweiler and Sumeet Gulati: "Reducing the Environmental Impact of Transportation - British Columbia's Tax Policy Initiatives", Canadian Tax Journal 60(4), December 2012, pp. 869-880. Werner Antweiler and Kathryn Harrison: "Canada's Voluntary ARET Program: Limited Success Despite Industry Cosponsorship." Journal of Policy Analysis and Management 26(4), Autumn 2007, pages 755-774. Abstract and full access via Wiley Interscience, including technical appendix. Werner Antweiler: "Estimating Voter Migration in Canada Using Generalized Maximum Entropy." Electoral Studies 26(4), December 2007, pages 756-771. Data sources and charts are available on my Voter Migration Estimation web page. Werner Antweiler and Murray Z. Frank: "Is All That Talk Just Noise? - The Information Content of Internet Stock Message Boards." Journal of Finance 59(3), June 2004, pp. 1259-1295. The Technical Appendix [Part 1, Part 2] to this paper contains additional descriptive statistics and regression results. This paper was discussed by Hal Varian in the Sept. 23, 2004 issue of the New York Times: Good Stock Advice or Online Noise? Werner Antweiler: "How Effective is Green Regulatory Threat?" American Economic Review 93(2), May 2003, pp. 436-441. Presentation slides from my presentation at the AEA conference in Washington, DC, January 4, 2003, are also available. The full-length version of the paper is current as of January 1, 2003. AEA members can view the published version of this paper on the AER web site. Werner Antweiler and Kathryn Harrison: "Toxic Release Inventories and Green Consumerism: Empirical Evidence from Canada." Canadian Journal of Economics 36(2), May 2003, pp. 495-520. Kathryn Harrison and Werner Antweiler: "Incentives for Pollution Abatement: Regulation, Regulatory Threats, and Non-Governmental Pressures." Journal of Policy Analysis and Management (22)3, Summer 2003, pp. 361-382. Werner Antweiler and Daniel Trefler: "Increasing Returns And All That: A View from Trade." American Economic Review 92(1), March 2002, pp. 93-119. AEA members can view this paper on the AER web site. Werner Antweiler, Brian R. Copeland, and M. Scott Taylor: "Is Free Trade Good for the Environment?" American Economic Review 91(4), September 2001, pp. 877-908. Reprinted in "New Developments in International Trade: Theoretical and Empirical Investigations", edited by Seiichi Katayama and Kaz Miyagiwa, Kobe & Business Research Series No. 16, The Research Institute for Economics and Business Administration, Kobe University, Japan, chapter 14, pages 307-354. You can download the Technical Appendix mentioned in the AER paper from this web site. We have also started collecting responses to questions about our paper in a separate Questions & Answers document. Werner Antweiler: "Nested Random Effects Estimation in Unbalanced Panel Data." Journal of Econometrics 101(2), April 2001, pp. 295-313. You can view an abstract of the paper on the Elsevier web site (the publisher of the Journal of Econometrics). If your university subscribes to Science Direct, you can also download the PDF file from the ScholarsPortal E-Journal Collection. I will make SAS code that implements the estimator available to interested researchers. I currently do not have a Stata implementation of this estimator. Reprinted in Badi H. Baltagi and George Sumney Jr. (eds. ): Recent Developments in the Econometrics of Panel Data, Edward Elgar, 2003. Werner Antweiler: "The Pollution Terms of Trade." Economic Systems Research 8(4), 1996, pp. 361-365. Werner Antweiler and kathryn Harrison: "Environmental Regulatory Incentives Underlying Canadian Industrial Performance," in Zhiqi Chen and Mark Duhamel (eds): "Industrial Organization in Canada: Empirical Evidence and Policy Challenges," McGill-Queen's University Press, chapter 10, February 2011, pp. 339-403. Werner Antweiler: "Standardization and Technical Barriers To Trade: Will standards become instruments of protectionism?" in: Sherrie Bolin (ed. ): The Standards Edge: Unifier or Divider?, Sheridan Books, 2010. ISBN 0-9748648-5-4. "Handbook on International Trade Policy", edited by William A. Kerr and James Gasiford, Cheltenham, Edward Elgar, 2007. Journal of International Trade and Development 17(3), September 2008, 463-466. "The Economics of International Trade and the Environment", edited by Amitrajeet A. Batabyal and Hamid Beladi, Lewis Publishers, Boca Raton, 2001. International Review of Economics and Finance 11(4), 2002, pp. 449-450. Werner Antweiler: "Ein Backpropagation Netzwerksimulator als konnektionistisches Expertensystem." Wirtschaftsinformatik 33(5), October 1991, pp. 398-407.